Antonio Brown, the Steelers superstar receiver and social media celebrity, has come under fire recently for putting too much emphasis on his superstar status and for, well, being on social media too much. Among Antonio Brown‘s many follies recently was his Facebook Live post in the Steelers’ locker room shortly after an exciting 18-16 victory over the Chiefs in the AFC divisional playoffs on January 15. I can go on and on about Antonio Brown’s various transgressions that include your usual diva-like receiver tendencies of whining and complaining about not getting enough passes thrown his way, but if you’re reading this article, you probably know it all by now. As is often the case in the Internet Age, fans have been quick to call for the Steelers to trade Antonio Brown to another team. Not all of the fans, mind you, but, relative to his status as perhaps the game’s top wide-out, enough to make it noticeable. “Trade him for two number one draft picks!” some fans have written or screamed in recent days. Fans are just crazy about the NFL Draft and draft picks. And any scenario that could involve Pittsburgh having multiple first rounders in this spring’s draft would be akin to counting down the days until Christmas morning for so many out there. But if you think Antonio Brown, who has one year left on his current contract, would garner two first round picks in a trade, you are crazy. Given Antonio Brown’s lame-duck status, fetching even one first rounder might be little more than a pipe-dream. However, that begs an even bigger question: even if you can garner two first round picks for Antonio Brown, why would you want to? First of all, contrary to what you always think every February, March and most of April, first round picks don’t always pan out. 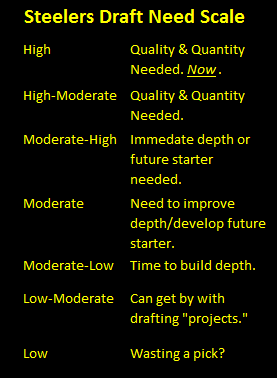 Secondly, how can a first round pick (or even two) possibly best what Antonio Brown has and will probably continue to produce on the football field week in and week out? I know what you’re going to say. Yes, Antonio Brown’s stats declined last year. He made 30 fewer receptions in 2016 than he did the previous year (106) for 550 fewer yards (1,284). But to point that out as a criticism of Antonio Brown while not also mentioning the probable reason is rather disingenuous. Given that the Steelers were missing Martavis Bryant for all of 2016, Markus Wheaton for all but three games and tight end Ladarius Green for all but six, it makes perfect sense that Antonio Brown’s numbers would see a swift decline from the year before. Factor in a couple-of-three games that saw Le’Veon Bell break Franco Harris and Jerome Bettis‘ rushing records, and Antonio Brown’s statistical dip is even easier to grasp. Remember that offense that everyone envisioned, the NFL’s equivalent of the Death Star, complete with a plethora of aerial weapons for quarterback Ben Roethlisberger to pick and choose how to obliterate opposing defenses? 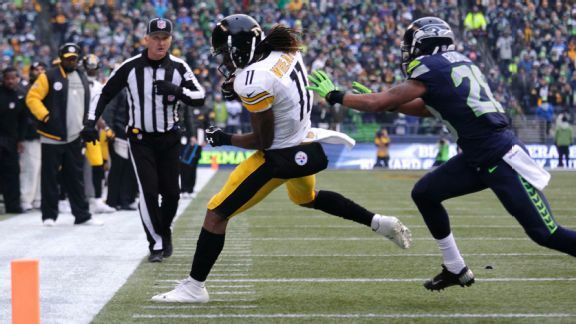 That kind of went up in smoke (pun intended) when Martavis Bryant was suspended for testing positive for marijuana for the second time in as many seasons. 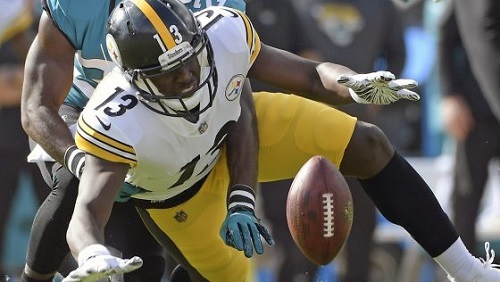 You throw in the aforementioned injuries to some other targets–Green was supposed to be the downfield threat at tight end that would compensate for Bryant’s absence as the number two receiver–as well as Sammie Coates‘ swift decline following a promising start to his second year, and Antonio Brown was destined to produce less in 2016. 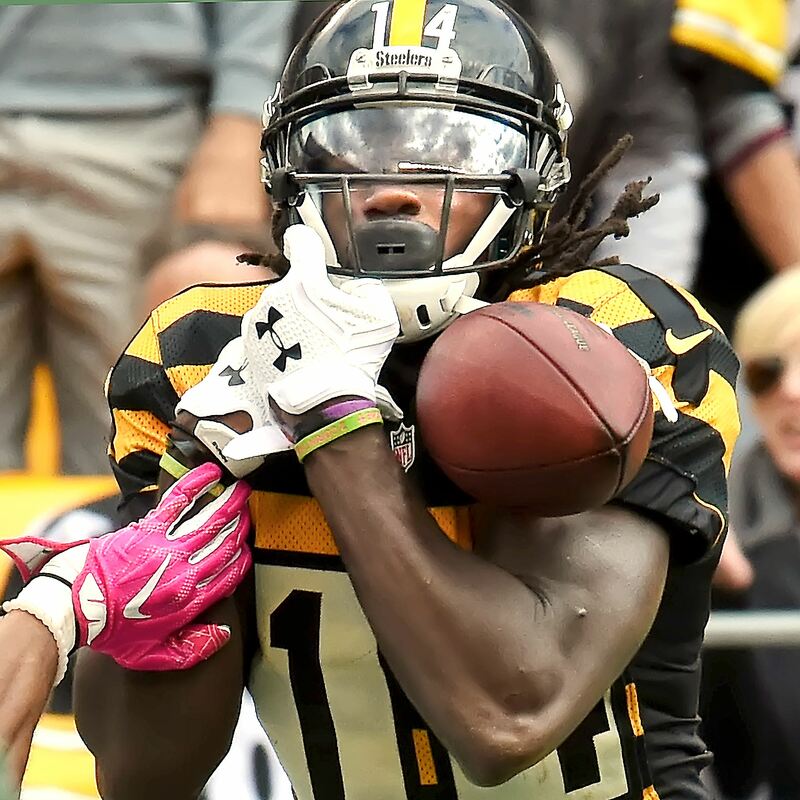 Let’s face it, when you have Demarcus Ayers, Cobi Hamilton and Eli Rogers (no offense to those men as they appear to be developing into a fine NFL receivers) as complementary targets, who do you think defensive coordinators are going to focus on stopping, them or Antonio Brown? This is why No. 84 often dealt with double and triple teams in 2016. This might also explain why Antonio Brown’s yards after catch (YAC) dropped from 587 in 2015 to 387 last year. Sure, it only makes sense that Brown’s YAC would decrease along with his overall yards, but it also illustrates the lack of room he had to work in after making most of his 106 receptions. And even if Antonio Brown had benefited from being complemented quite nicely by Martavis Bryant, Marcus Wheaton, Sammie Coates and Ladarius Green in 2016, this does not mean his statistics wouldn’t have taken a dip. After all, Antonio Brown averaged 125 receptions a season between 2013-2015, a pretty historic run of productivity for a receiver from any generation–even one playing in the current era of pass-happy football. Still Want Steelers to Trade Antonio Brown? Careful for What you Wish…. Again, fans are often quick to want to cut a player loose these days, even if his talents are all-world and his transgressions aren’t of the legal nature. But, whether the fantasy football mentality or something else fuels this – careful what you wish for. Let’s not forget, Pittsburgh’s franchise quarterback hinted at retirement mere hours after the Steelers 36-17 loss to New England in the AFC Championship game. It is believed that Ben Roethlisberger’s hints were mostly out of frustration, that he was tired of the likes of Antonio Brown and his antics. However, despite an apparent friction between No. 7 and Antonio Brown, does anyone really think that the best way to entice Ben Roethlisberger into playing longer would be to eliminate his number one target, arguably the very best in the game at his position? Yes, Antonio Brown is apparently a high maintenance member of the locker room and maybe a little more self-centered than most receivers (and that’s saying something), but this is the man who essentially saved the Steelers season, when, despite three defenders vehemently trying to prevent him from doing so, extended his arm over the goal line with nine seconds left to give the Steelers a pulsating 31-27 victory over the Ravens on Christmas Day, which clinched the AFC North title. Brown is also the same man who had the presence of mind to keep running across the field late in the divisional round against the Chiefs, got himself open and clinched the victory by reeling in Roethlisberger’s pass on third and three. 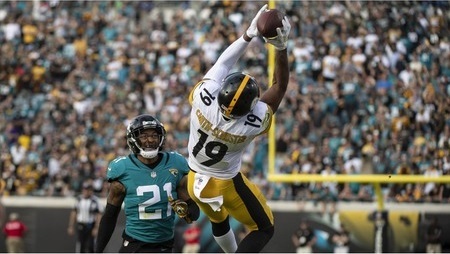 Fans have also been quick to point out that since Pittsburgh has produced a seemingly endless string of receivers in recent years–let’s not forget Antonio Brown was once part of the Young Money trio that included Mike Wallace and Emmanuel Sanders–he could be replaced, if not totally, then approximately. But with 632 receptions in just seven seasons–including four-straight with 100 or more– Antonio Brown is quickly ascending up the record books of Steelers receivers and could quite literally ellipse all of the records set by Lynn Swann, John Stallworth and Hines Ward while he’s still in his early-30s. Despite what you think of him, and despite his apparent need to grow up just a tad, there is only one Antonio Brown. Part ways with Antonio Brown, and the Pittsburgh Steelers are a lesser football team. I don’t think anyone is ready for that. Although the Steelers injury report still lists him as “Questionable” word is that Ben Roethlisberger will start for Pittsburgh vs. the Ravens at M&T Bank Stadium today. The news is welcome. Landry Jones first start in the Steelers loss to the Patriots wasn’t the disaster many (including yours truly) feared it would be. But starting at home is one thing, starting away is another. It set up Ben Roethlisberger’s final winning effort at M&T Bank Stadium. Since the 2010 Steelers glorious Sunday Night Football win over the Ravens, Ben Roethlisberger (and the Steelers have struggled at M&T Bank Stadium. In between, of course there was the Charlie Batch authored 2012 upset of the Ravens, but that game has been the exception, not the rule. 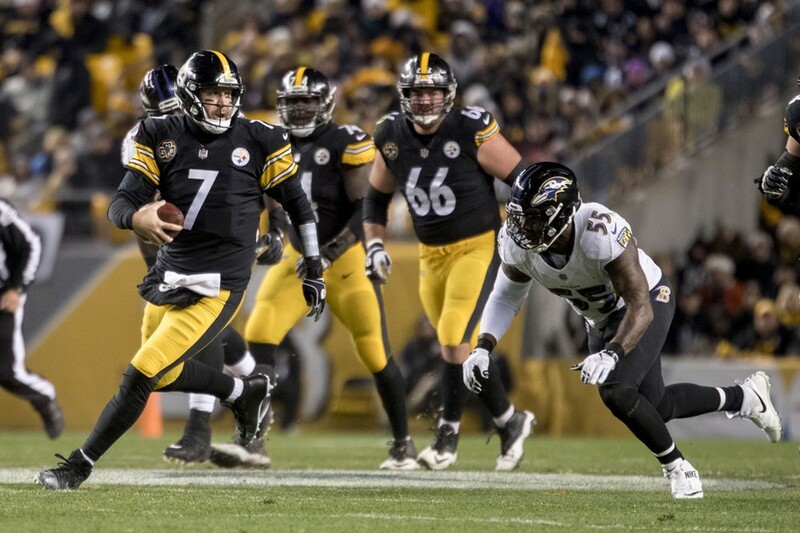 Ben Roethlisberger’s lifetime record vs. the Ravens is 9-8, a stat which includes his rookie debut and improves to 11-9 if you include Roethlsiberger’s playoff appearances against the Ravens. 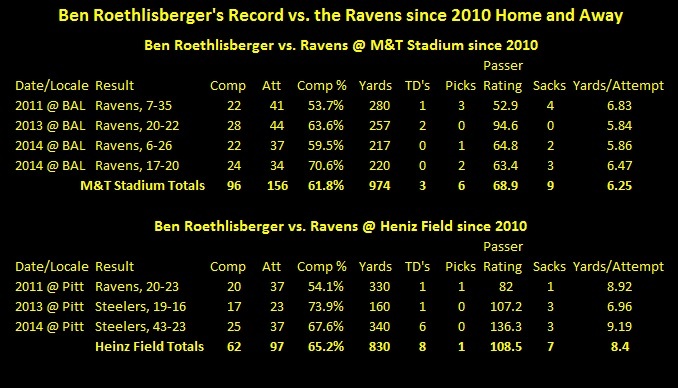 However, since that fateful night in 2010, Roethlisberger is only 2-5 in the regular season vs. the Ravens and 1-1. And as we can see above, none of those victories have come at M&T Bank Stadium. First you can see that he hasn’t had a 300 yard game in Baltimore since 2010, where has he’s done it at Heinz Field twice, although to be fair those are his only two 300 yard games in the regular season series. He completes about 3.3% fewer passes at M&T Bank Stadium than he does at Heinz Field – no big difference there. 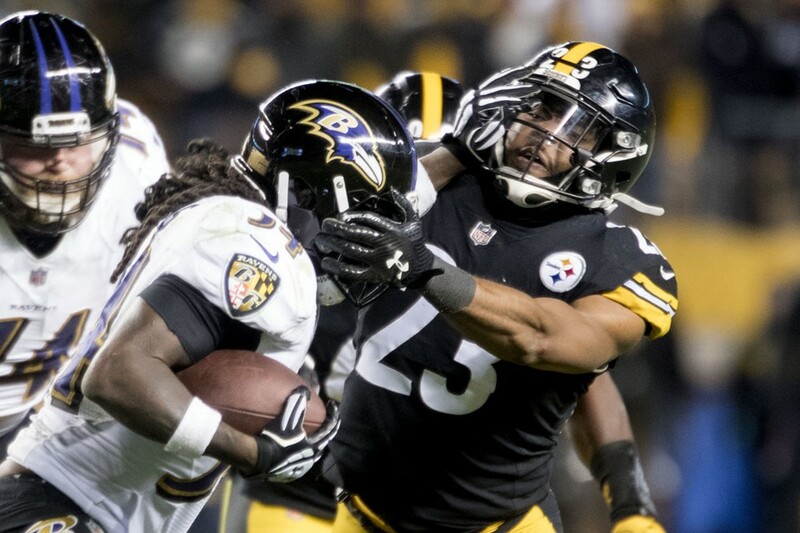 Neither do sacks appear to be a determinative issues, as the Ravens have sacked Ben Roethlisberger 7 times in 3 games at Heinz Field since 2010 and 9 times in 4 games at M&T Bank Stadium. 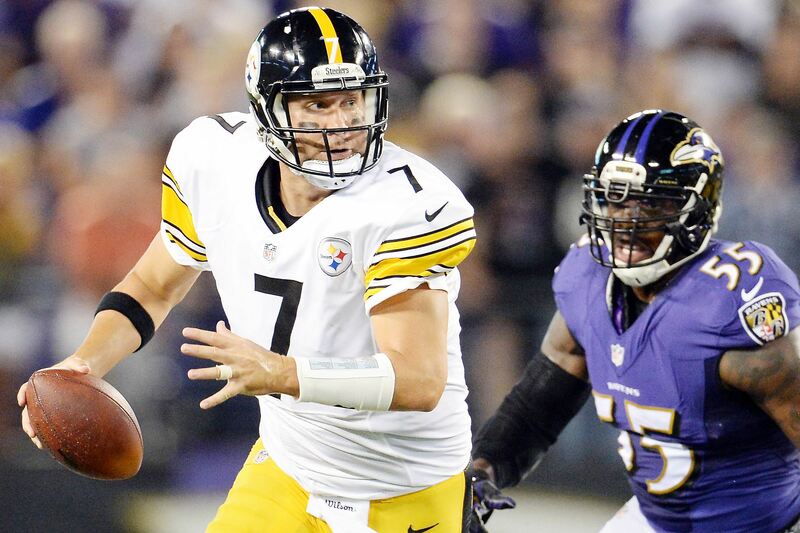 Interceptions are the real culprit for Ben Roethlisberger at M&T Bank Stadium. Ben Roethlisberger has thrown 6 interceptions at M&T Stadium since 2010 and only 1 at Heinz Field. 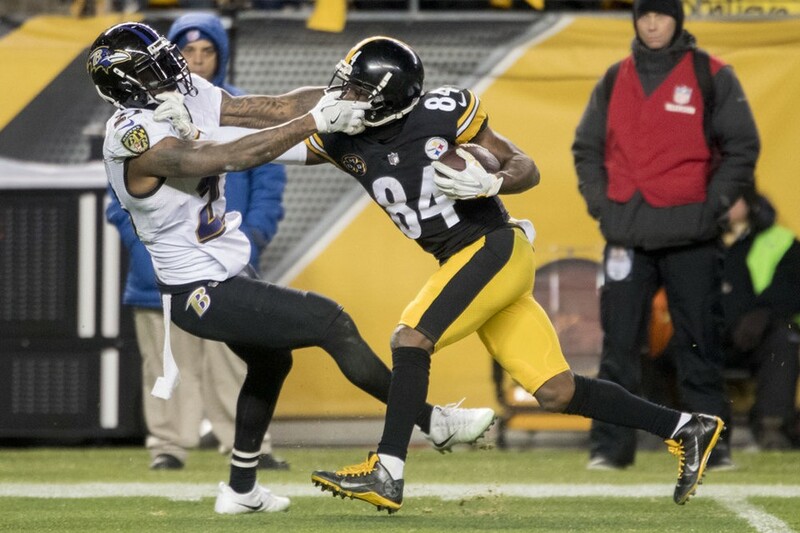 Whether he’s targeting Antonio Brown, Le’Veon Bell, Heath Miller, or Hines Ward, Rashard Mendenhall or Mike Wallace, Ben Roethlisberger tends to hit the guys in Purple at M&T Bank Stadium. In 13 career games vs. the Baltimore Ravens, Antonio Brown has 1 touchdown pass. If the Steelers are to break that cycle and assert their stamp on the AFC North title race, and if Ben Roethlisberger’s M&T Bank Stadium losing streak is to end, Todd Haley had better find a way for Number 7 to get the ball to Number 84, preferably in the painted parts of the field. 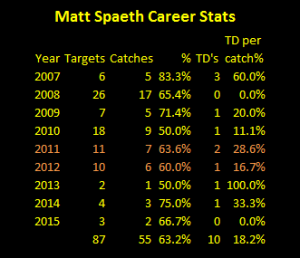 But is it also fair to ask: Were Matt Spaeth’s pass catching skills underutilized? No Steelers Nation, that’s not a rhetorical question, but rather a serious one. When the Pittsburgh Steelers drafted Matt Spaeth in the 3rd round of the 2007 NFL Draft, the 6’7” 260 pound tight end promised to offer Ben Roethlisberger a tantalizingly tall target. And early on it looked like he would do just that. In his first four career games, Matt Spaeth caught four passes, and three of them were for touchdowns. Despite his strong start, Spaeth’s role as a pass catcher never evolved, as the 6’7” tight end’s pass catching production peaked in 2008 at 17 catches on 26 targets. Do numbers lie? Matt Spaeth caught most of the balls thrown his way. Mike Tomlin and Todd Haley never got the memo. During 2015, Steelers quarterbacks Ben Roethlisberger, Michael Vick and Landry Jones only targeted Matt Spaeth three times. For the record, Spaeth caught 2 out of three of those passes for 10 yards, but honestly that doesn’t tell us much. 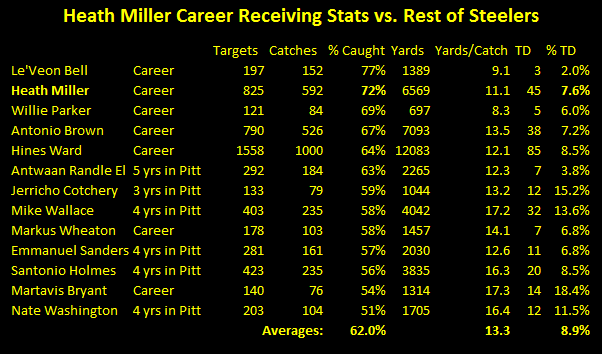 Nor, honestly speaking, does his career target-to-catch ratio of 63.2% suggest much because the sample is so small. Spaeth’s dependability as a pass catcher is on par with Antwaan Randle El and just below Hines Ward, while better than Jerricho Cotchery, Mike Wallace, Markus Wheaton, Emmanuel Sanders, Santonio Holmes, Martavis Bryant and Nate Washington. Matt Spaeth excelled at catching touchdowns. Matt Speath’s catch-to-touchdown ratio is 18.2%. In otherwords, almost one of ever five passes Matth Spaeth caught went for a touchdown. Only Martavis Bryant has been better and only three others have numbers in double digits. Yes, the small sample size perhaps distorts things a bit, but it does prove that when the ball got near Matt Spaeth when things were most important, he generally made a catch. All of this begs the question: Why didn’t the Steelers target Matt Spaeth more in the passing game? The easiest, and most likely correct answer, is that Spaeth dropped a lot of passes in practice. That idea is supported by the fact that Spaeth’s most prolific pass catching spell came during 2010, when he started several games for after Heath Miller suffered a devastating concussion vs. the Ravens. During that season, Speath only caught 9 of the 18 balls thrown his way, and didn’t score any touchdowns. Still, if that is the case, why would the Steelers call Spaeth’s number so frequently in the Red Zone? Steelers Nation will never know the answer for sure. But the numbers certainly suggest that Matt Spaeth’s pass catching skills were underutilized during his time with the Steelers. Even if that is true, that fact would fail to alter one fundamental fact: Matt Spaeth blocked incredibly well. Although Le’Veon Bell dazzled as a rookie, his performance as pure rusher remained in consistent, and deep into December, Bell had still failed to break the 100 yard rushing mark. That change just before Christmas at Lambeau Field when Bell romped for 124 yards, which was also Matt Spaeth’s 3rd game back from injured reserve. That’s no coincidence, although if you’re wondering, that Green Bay game also saw Matt Spaeth’s 2nd and final target of the season – which he caught for a touchdown…. …Steel Curtain Rising thanks Matt Speath for his service in Pittsburgh, and wishes him well on his next NFL stop and/or retirement. Where to Rank Antwaan Randle El Among Steelers Wide Receivers? “Asked and Answered” is one of Steelers.com’s most popular features which sees Bob Labriola answer questions from Steelers Nation. The feature is the successor to “Overview” page of Steelers Digest, where Labriola would answer questions with equal parts wisdom and sarcasm. His recent answer defining the top 5 receivers Steelers history both surprised and offered food for thought. The choice of Louis Lipps earns the full-throated support of this site. Louis Lipps statistics might be pedestrian by 2016’s standards, but Lipps was an All-Pro Caliber receiver playing in a run-oriented offense and forced to catch most of his balls from Mark Malone and David Woodley as opposed to benefitting from having a Terry Bradshaw or a Ben Roethlisberger throwing his way. Louis Lipps is also the Steelers 4th leading wide out in terms of yards and catches. ….even if he’d only made that one catch in Super Bowl XLIII, ‘Tone would belong in the discussion. But does Antwaan Randle El belong in this conversation? Steel Curtain Rising holds Antwaan Randle El in high esteem. Randle El arrived as part of the Steelers 2002 draft class, and made an immediate impact as a wide receiver and kick returner. His skill as a quarterback was Inspector Gadget aka Mike Mularkey’s dream. While most of his time was spent as a number three or slot receiver, when asked to take over the starting role, Randle El was up to it. And no one in Steelers Nation need be reminded of how Ken Whisenhunt deployed Randle El versatility with lethal effectiveness in Super Bowl XL. But does Randle El deserve consideration as the Steelers 5th, or even 6th best wide receiver of all time? Respectfully, Steel Curtain Rising argues that there several Steelers wide receivers who should rank ahead of Antwaan Randle El. Who? The first two names that jump to mind are Plaxico Burress and Yancey Thigpen. Burress is 9th on the Steelers All-Time receiving list whereas Randle El is 23rd. Thigpen is 14th on the list and caught 3 times as many touchdowns. What about Mike Wallace? Wallace career production is actually above ‘Tone’s, but for my money both Santonio Holmes playoff production and perhaps Antwaan Randle El puts them above Wallace. Then there is one player who played before Chuck Noll’s time who also deserves consideration, Buddy Dial. Matthews. Buddy Dial played in Pittsburgh from 1959 to 1963, playing 12 and 14 game seasons and in an age when a run first mentality dominated the entire league, yet he still ranks as the Steelers 8th leading receiver. Actually, Dial is sixth if you limit the list to wide receivers. So where to rank Antwaan Randle El among Steelers wide receivers? Steel Curtain Rising doesn’t honestly know. Numbers don’t like but sometime statistics deceive. Dwight Stone is ahead of Randle El on the Steelers all time receiving list, and if you were picking All-Time Draft Steelers draft, would you pick Stone over Randle El? Neither would I. Charles Johnson also ranks ahead of Randle El but I’d think twice about picking him over Randle El. At the end of the day, I’m undecided about where Antwaan Randle El ranks among Steelers wide receivers, but I do know that I’d put at least put Plaxico Burress , Yancey Thigpen, Buddy Dial and perhaps Mike Wallace ahead of him. Where do you think he belongs? Take a moment to leave a comment.